They make politicians in a tougher mould in Australia, as Natalie Bennett, the British Green party’s new leader, demonstrated yesterday when she was in great robust form when she came to support Shasha Khan, her party’s candidate for the Croydon North by-election on Thursday. Bennett insisted that she had “not allocated” a name to go with the latter description. Who could she have in mind? Andy Stranack? Lee Jasper? Steve Reed? She is probably referring to Jasper, as the Greens are competing with his Respect party for the radical votes. Bennett, a former journalist, said that voting for Khan is “the only clear way of sending a message to Boris that Croydon people do not want the incinerator”. 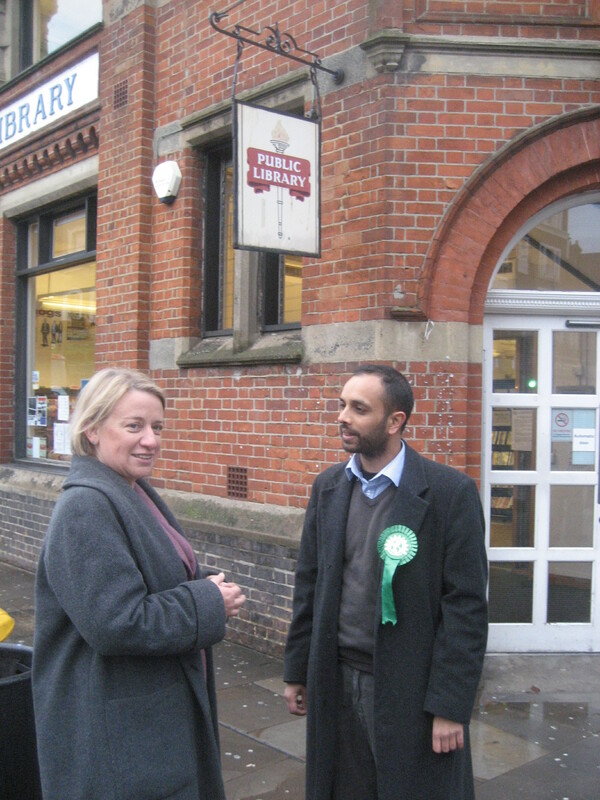 The two Green politicians met outside the troubled Upper Norwood Joint Library, which has been so starved of funds by Croydon Council that the library is running its own “Flush Fund” to appeal for money from members of the public just to repair its broken toilet. There seemed to be few Green members for the party leader’s visit: if that is signal of the support that Khan can expect at the ballot box on Thursday, he may struggle to match the number of votes won when he stood at the General Election and finished fourth. This entry was posted in 2012 by-election, Andrew Stranack, Croydon Greens, Croydon North, Environment, Lee Jasper, Shasha Khan, Steve Reed MP and tagged Ben Stevenson, Croydon, Croydon North, Green, Lee Jasper, Liberal Democrats, London Borough of Croydon, Natalie Bennett. Bookmark the permalink.